One of the most beautiful buildings in the world, the Taj Mahal, in its gleaming white marble and semiprecious Indian stones bathed in the “sky blue pink” of the dawn. Even more beautiful is the story of the love of the Shah Jahan for his favorite wife Mumtaz after she gave birth to his fourteenth child while traveling in the countryside with her husband. Mumtaz was buried in the country where she died in 1631. Her husband began the the construction of her tomb in 1632 and was completed 16 years later in 1648 when his beloved favorite wife was laid to rest in her tomb. This dramatic mausoleum is considered the “jewel of Muslim Art in India.” It is one of the wonders of the world and has millions of visitors from around the world each year. The students said that they had been asked over and over if they had seen the Taj, and now would be able to answer in the affirmative! 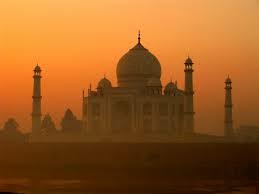 The Taj is a universal symbol of India. When we were there a few days ago, it was evident that security has was much ramped up from our visit in 2013. Parking is in lots very far from the wall and entrance. There is a metal detector and bags are searched and patted down. This is the letter of the law for foreigners and Indians alike.One new restriction was that the students could not take pens and their sketch books! They were all excited to draw and had started as we stood on the river bank opposite the Taj to watch the sunrise early in the morning. It was a crushing blow for them not to be able to document their visit with a sketch. It was explained that India wants to protect the beautiful marble from initials written in the buildings. Already a restriction in 2013 was no water or food allowed. This we were glad of because there is no trash and the site is pristine. Some of the students last trip stayed from early morning and stayed without food or water for the whole day. . . . . filming , shooting images, and of course sketching! If you leave , you need to buy another ticket for reentry and at 750 rupees which is roughly $12.50. We were so looking forward to having dinner on a rooftop restaurant in Agra as the light faded to dankness and enveloped the Taj. Much to our disappointment, the government had closed those restaurants on the roofs for protection for the visitors! Just more rights taken away in a democracy. . . . for our own good. These rights removed in these circumstances never seem to be returned to the people. It seems this is happening everywhere, and I for one am not happy. Freedom of choice and freedom of the press in editing news such as India forbidding the documentary of “India’s Daughter” is stopped to prevent violence in the streets. These are rights that are an integral part of democracy. . . . is is slowly slipping away? Previous post on the Taj for those of you who might want to see it. This entry was posted in Architecture, India, Travel, Uncategorized and tagged Agra India, blogging, photography, Taj Mahal, travel. Bookmark the permalink. Thank you . . . it was a wonderful day! Oh how wonderful! How long will you be in India? Are you travelling in a group? I may have posts on the other places you will see and would be glad to send them onto you ! You will be close to the Amber Fort in Jaipur and where the elephant rides are. I love the Amber Fort. Will send you the link ! Elephant rides?! Wow I didn’t even think of that! You’re awesome thanks so much!! Thank you so much! Do you know of any sites that offers Agra and Jaipur tour? We just got back from the north tour, but it is a lot of architecture because husband is a professor and has 10 students. My favorite is Veranasi which the Hindu mythology says is 9000 years old. It is the holiest city in India . Google it with the ghats(steps) going into the Ganges. There are cremation fires and people with incredible faith. It is very intense and often tourists are encouraged NOT to go there, but I love it. Amritsar to see the Sikh Golden temples is awesome. we were there yesterday. they run a soup kitchen run totally by volunteers that sometimes feeds 100,000 people in one day! You can eat if you wish but certainly walk through the kitchen and serving room. Amazing people. Udipur, Jodphur, and Jalsallmer the white, blue, and golden cities of Rajasthan are amazing. It is a very strong and vibrant culture. Don’t be afraid to smile and speak to the Indians and say namaste. I shake as many hands as possible, too. Bring pens and chocolates for the kids. YOu will be asked repeatedly to have your picture taken. I always do it with a smile. I may be the only American they will ever meet. If you take their picture , show it to them on the screen afterwards. Thought you might like that post from Ahmedabad where we are located ! The taj is closed to the public on Mondays and to all but Muslims on Friday for praying at the mosque. Make sure the planner knows that! Thank you for all your information!! I really appreciate it 😀 Now I just my trip to come sooner! I hadn’t answered your question. Husband went to travel agent in Ahmedabad and told him what we wanted to see, how much. For the 11 day north trip which I have described. . . . transportation and hotels for 12 were $1000 per person. Food paid per person. I had to pay entrance tickets etc. Husband’s covered by university, mine are not. We had local guides provided by the hotels. . . . 3-4 stars for about $17 per day. Gave good tip. They stay with us all day !